Staffs were very nice. Everything was good during my stay, and I stayed for only one night. Overall was good. Great location in the heart of Chinatown and great value for the location. Includes breakfast. Room had very good air con, very cold. WiFi was a little slow at times. The hostel is nice and with a great location but it's probably good to know that they don't have enough lockers for everyone (you'd expect a locker for each bed but that's not the case). So maybe you wanna double check that you'll have a place for your valuables (they finally found a locker for me after I gently insisted on having one). Great location, on top of the metro & in the heart of China Town. The cleanliness rating is no fault of the hostel - guests were V inconsiderate despite the cleaning ladies cleaning regularly throughout the day - unfortunate timing for me. Didn't have to queue for showers and soap & hair dryer provided for use. The rooms have no windows so not fresh air or morning light, lockers available at request & friendly FOH staff. Breakfast simple but plentiful - overall a decent stay for the price. During my 8 Day stay, I had a really nice time. The location is optimal for those that want to experiance Chinatown. I can during Chinese New Years and you really get a feel for the festivities, plus being close to the Chinatown Train Line was fantastic. As for the facilities, they are simple, but could use some work. The doors to the toilets were a bit of a hassle and the shower heads are not fixed. 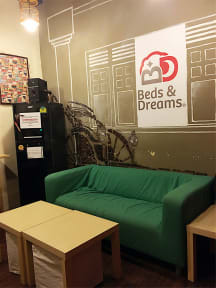 The common area are nice if you need alone time, but this is not a social hostel, so be prepare. The hostel is full with beds. My room had 4 bunks in but there was only really space for 3 max. No curtain but there was a socket. No windows or natural air so it got smelly. The lockers are outside in the main corridor and you have to pay a deposit to use them. There were children running around in the evenings and mornings, sometimes loudly. The atmosphere is completely dead but maybe I was just unlucky . The staff are nice and the location is great though, 1 min walk from MRT. Really weird atmosphere. Full of old Asians when we were here (possibly because it was Chinese New Year and its in Chinatown). Don't stay here if you want a normal backpackers' vibe. Bathrooms were completely external and breakfast had run out of bread within half an hour of opening. The Chinese guy we shared a room with didnt mind playing music on his phone (without headphones) until after midnight. Reception only manned from 8am-8pm which is very inconvenient if you arrive after 8pm like us. Staff is not nice at all. The hostel is in a boring location.